As the name implies, content marketing is all about using online content to market your business, making people aware of your business and what it does. It’s about offering content that internet users want to read, and it’s about ensuring your website appears in Google searches. You might think that as a freelancer this is something you should leave to the big boys, those limited companies with more cash to spare. But this isn’t the case at all. One of the reasons content marketing is so great is that it can be a relatively low-cost method of putting yourself on a level playing field as your bigger competitors. 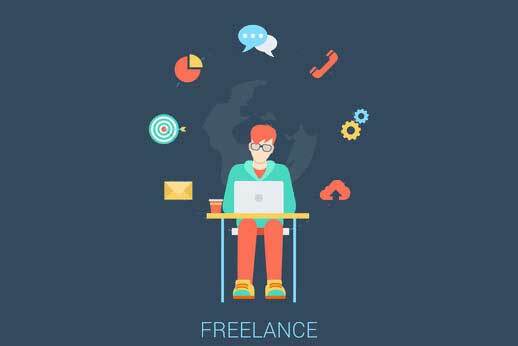 Here are five reasons why content marketing is the right thing to do for a freelancer. You’ve probably had this experience plenty of times yourself: you go on the website of a business and notice that their website hasn’t been updated in five years. You decide that they are irrelevant or don’t know what they are doing so you immediately leave the website. Regularly updating your own website with fresh content is the way to keep you looking relevant and the way to stop visitors leaving straight away. Google also favours websites with regularly updated content so you’ll appear in more Google search engine result pages (or SERP for short). One of the ways content marketing can put freelancers on a level playing field with bigger businesses is by making you look like an expert in your field. If a business offering the same service as you doesn’t offer visitors to its website free advice, but you do on yours, it will be you that people trust since you’ll show yourself to be somebody who knows what they are doing. The internet, and social media websites particularly, mean that people love to share and to talk about the things being shared. But they need content to share. That’s where you come in. When you create new, interesting content it can be shared by users of social media, and that means more traffic to your website, which means a chance that some of those visitors will become customers. Content marketing doesn’t usually work overnight. A visitor to your website won’t immediately be converted into a customer. But if you keep giving them content they want and enjoy, they will keep returning to your website, and slowly they’ll start to trust you as a freelancer and as a brand, and they’ll eventually become good customers. Most people have limited money, so they think carefully about any they spend, and think carefully about whether a product or service is really right for them. Having content on your website that is related to your products and services means visitors and potential customers have more information to make a better decision. And if you do your job right, they will see that the better decision will be for them to spend money on your freelance services.